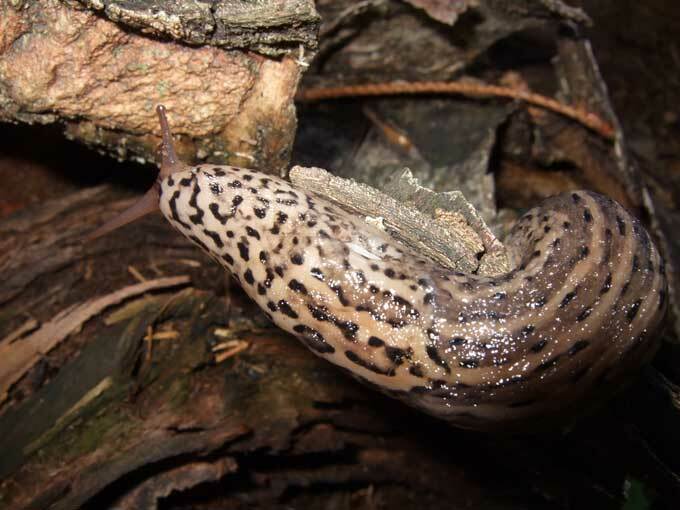 As I cleaned out my decomposed mushroom logs last week I spotted a common, plant destroying slug that was wandering across one of the logs. Well actually I didn’t notice the slug until after I laid my hand right in the middle of a trail of its disgusting slime. No wonder these garden pests are so detested. I never realized how annoying that slime could be, or just how difficult it is to wash off of your hands. 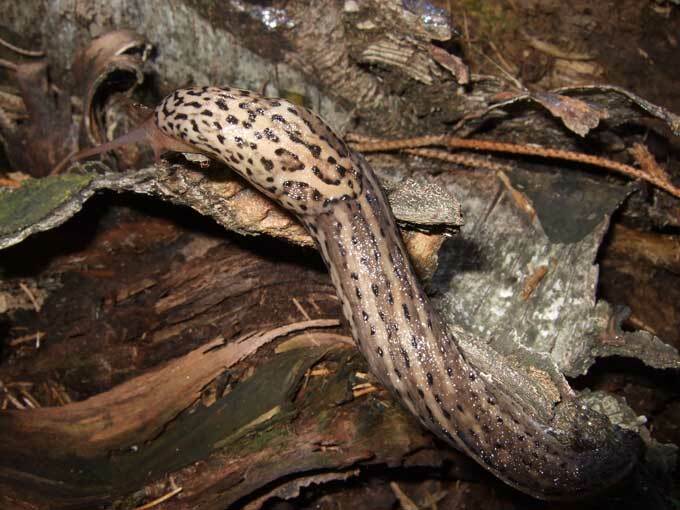 Beauty, Grace, and Power… From a Lowly Slug? In a strange way it reminded me of an animal that you would expect to discover on a jungle safari more so than in a backyard garden. Its appearance and proportions brought to mind a huge, powerful, boa constrictor, while its markings and patterns made me think of a tiger or a spotted leopard. Even the way that this stealthy slug slowly and methodically felt its way around and explored its surroundings reminded me of a lion on the prowl for prey. I don’t know what its mission was, but I would hate to be the object of attention at the end of this journey. Turtles and snails aren’t exactly known for their speed and agility but it was kind of surprising to note how much ground this slug covered in a short period of time as it weaved in and out, and over and about everything in its path. It found a clever way to safely traverse every gap, barrier, or roadblock that it came upon. It was also pretty amazing to notice how well it was camouflaged and blended into the background of the debris and litter scattered over the ground. I may not have even seen it in the first place if I hadn’t gotten slimed, and anytime I walked away and returned to the area I had to look closely to discover where it had maneuvered to. And again, this is one super sized slug that we’re talking about, there’s nothing in the photo to provide a sense of scale but thinking back it must have been close to a foot long… well alright… but seriously, it had to be well over five inches from head to toe, not to mention how wide around it was! Considering that slugs don’t have a shell and couldn’t outrun molasses, that camouflage may be the only thing keeping this slab of escargot from becoming dinner to birds and other animals looking for a tasty snack. Whatever the reason this critter sure seemed pretty confident and care free the way it wandered around in broad daylight. Sure my reaction and this story may have been completely different if I had stumbled upon that same slug venturing anywhere near one of the vegetable garden’s raised beds. In that situation I doubt that our paths would have crossed and parted in the same manner that they did. But this turned out to be one of those unexpected encounters where I was able to gain a bit of respect and a better understanding by taking a closer look at something from a slightly different perspective. They haven’t bothered my garden this year, so as long as they don’t bother me, I won’t bother them. Great post! 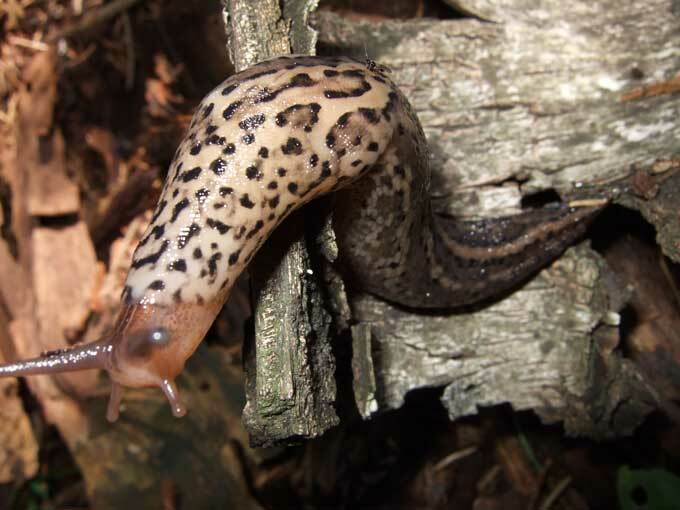 I used to get slugs like that at my first house (and garden) in Indiana. I never could get used to them. They are huge and leathery to the touch and hell on hostas. I remember complaining to my mother over the phone about my slug problem and she suggested that I simply squash them in my hands. She thought I was pretty whimpy until she came and witnessed their size herself. That was the biggest slug that I’ve seen around here. A couple seasons ago I was having trouble with slugs eating lettuce and other plants in the garden but lately I have not had a problem with them. I think part of the reason is because the weather has been a lot drier and hotter than the slugs would like. I don’t believe these slugs belong in Virgina either. However, every evening my family and I watch them slither along my sunflower pots. They don’t seem to be bothering anything so we just watch. I live in MO and I have just found what I think is a slug. First time I have ever seen one like this. Thought it was a snail at first, no shell though. Head looks like a Hognose snake in miniature, brown splotch on head, yellow around top ridge of head, brown black and gold skinnier body. Tail is fan shaped, not as big as head and lt gold/yellow! When disturbed, two red V-shaped snaillike antenna come from below head. Eating a Bush? in my flower bed. Otherwise we have Normal size, run of the mill garden snails! I guess in theory slugs are amazing, but I have had a lot of bad experiences with slugs destroying my garden that I hate them! Next post: Manitoba Garden Forecast – Continued Cold!